A survey done recently by Houzz, a home remodeling and design website, showed that more and more homeowners prefer small houses, 1,000 feet or less. Often the smallest home in the neighborhood, these homes are relaxed and easy to keep clean, according to the owners. However, these homeowners use certain tactics to utilize their space and make their home still feel open. One method is having a lot of natural light. Another way to make the space feel less constricted is having an open floor plan, and expanding the living space to the exterior, as well. In line with this trend, I am proud to be a part of a new project in Greenfield, Green River Commons (pictured right). Construction of these seven sustainable, ground level townhouses began in early November, just steps from downtown Greenfield. These low-cost condominiums are designed to be energy-efficient with LED lighting, roofs to support solar panels, energy star appliances, and more. They also have sensible floor plans that utilize the smaller space to maximize comfort. 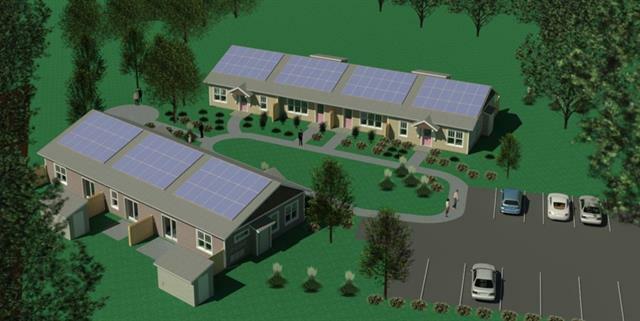 Contact me today to learn more about these new affordable, sustainable homes or visit GreenRiverCommons.com.